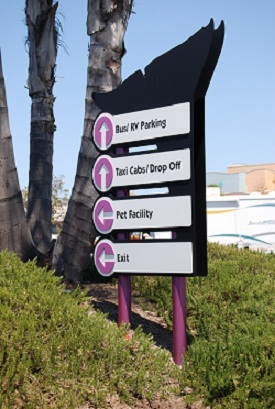 Customers are more comfortable and safer when strong directional and wayfinding signs are present in commercial parking lots. Directional signs are smaller than monument signs, ranging in height from 2 feet to 6 feet, making them easily visible at short distances. These signs are used for conveying directional information, rather than representing a recognizable logo. Once a customer has reached the place of business, smaller on-premise signs are often used to instruct them which way to go. Placing directional signs at the street can help motorists identify the business and indicate which driveway to use for the entrance. 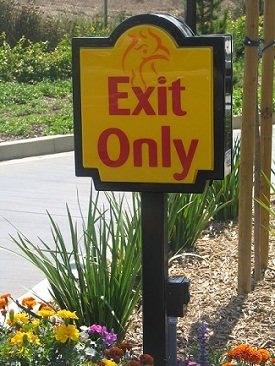 Directional signs can point traffic to parking areas, drive-thru lanes and registration areas. These signs are especially important for on-site safety where there is a possibility of confusion for the driver. Keeping traffic flowing smoothly from the street to the final destination is the ultimate goal of any successful wayfinding signage. The format of these signs can vary widely from simple post and panel systems, to elaborate way-finding signs. Frequently, these signs are constructed to match the clients building color and logo scheme.